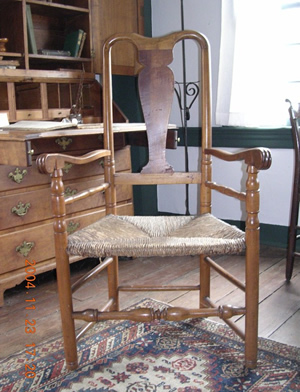 Maple yoke back side chair made in Newtown, circa 1750-1770. Tin tenth anniversary gift lighthouse form coffee pot descended in the Johnson family. 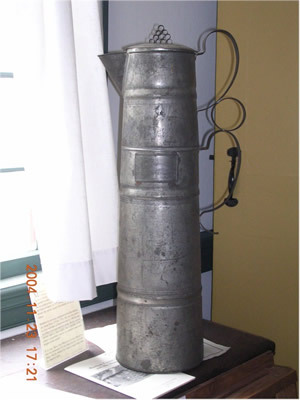 With the gradual decline of industry, Newtown returned to being primarily an agricultural town specializing in dairy farming. This sustained the town for the first half of the century. Unfortunately farming does not supply much in the way of town tax revenue and so the town had problems during this period maintaining some of its most basic services. In 1916, for example, the town's high school was in such need of financial attention that the state removed its accreditation. When the High School burned in 1920, Mary Hawley, the sole heir of the hardware and railroad magnate, Marcus Hawley, made the first of several benefactions to the town. The new school, named Hawley School after her parents, still stands on Church Hill Road, and is being used as an elementary school. In addition to the Cyrenius H. Booth Library (named after her maternal grandfather) mentioned above, Miss Hawley also donated the Edmond Town Hall named after William Edmond, her maternal great grandfather and one of the most illustrious citizens of the town. (He had served and been wounded in the Battle of Ridgefield during the Revolution, served as a state legislator, a member of the United States House of Representatives, and as a state supreme court judge.) Miss Hawley also developed the entrance to the Village Cemetery and donated a holding vault as well as the War Memorial which stands at the head of Main Street. The period since the Second World War has seen the most dramatic changes in the town's history. As the automobile allowed workers to move farther away from the place where they worked, towns such as Newtown became valuable places for housing, and so rapidly became a suburban town to the larger cities of Bridgeport and Danbury. Between 1950 and 1990 the population of the town almost tripled, going from 7,500 to 21,000. The 2000 census shows Newtown's population exceeding 25,000. This unprecedented growth has created strains in the town's educational facilities as well as on other areas of its infrastructure. Some small industry has moved into town such as warehousing facilities for Georgia Pacific, Ethan Allen, Lazy Boy and Pitney Bowes, but their contribution to the town's tax base is small. The future challenges for the town will center on attracting such industry and businesses that will increase that tax base while maintaining the rural suburban nature of the town."